High School for Performing and Visual Arts Goes Underground! - Rice & Gardner Consultants, Inc.
High School for Performing and Visual Arts Goes Underground! 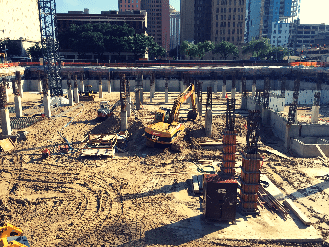 The performing and visual arts magnet school, High School for the Performing Arts & Visual (HSPVA), is currently underway construction in downtown Houston. General Contractor on the project, McCarthy Building Companies, is being seen installing the spread footings, the perimeter basement walls, and subsurface drainage. Built in the heart of the city’s fine arts and theater district, the new 168,000 square-foot building consists of two levels of underground parking and five-story rise above ground. The building will feature dramatic double-high glass windows and wide stairwells, along with an 800-seat main theater with a balcony, dance and music studios, a modern outdoor dining area on the first level, and an outdoor roof terrace. HSPVA is expected to be completed in Fall 2018. Next PostNext Tanglewood Middle School Celebrates Opening!